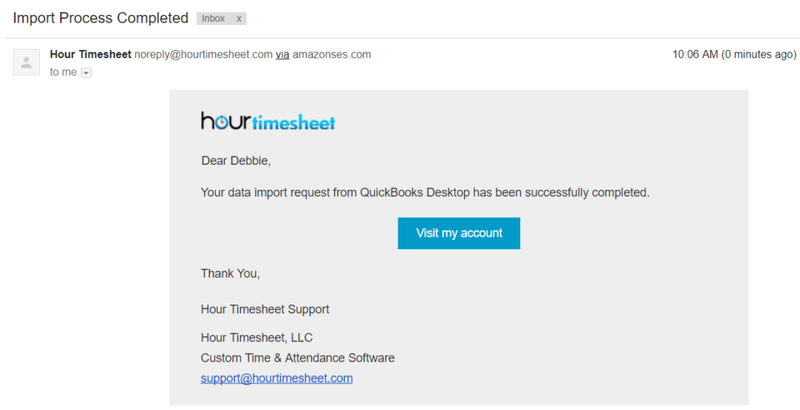 Hour Timesheet utilzes the QuickBooks Web Connector to enable the exchange of data between QuickBooks Desktop an Hour Timesheet. To sync your data, you will need access to your login credentials for your QuickBooks Desktop account. You are able to select which data elements to sync between QuickBooks and Hour Timesheet. The import tool will sync Employees, Customer/Jobs, Payroll Items, Service Items, Classes and Vendors. Click the Connect to QuickBooks tab (this article requires that the initial data sync has already been established during the setup of Hour Timesheet and that the web connector file is linked from your QuickBooks company file to your Hour Timesheet account. See Web Connector Installer for more instructions. Click the Request for Import button to initiate the import process. NOTE 1: The import process is not immediate and may take some time (up to 60 minutes). Once the data import process is complete, you will receive an email with the details of the import. NOTE 2: The import process should be run each time new data is entered into QuickBooks. NOTE 3: Hour Timesheet does not allow Customer/Jobs, Service Items, Classes, Payroll Items or Vendor data to be added through the Hour Timesheet software. You must add the data to your QuickBooks company file first to sync the data. Hour Timesheet does allow for employee data to be created using the software but these employees WILL NOT sync timesheet data back into your QuickBooks file.